Alicia Silverstone heads the cast in a story about three very different sisters which is entertaining but overly familiar and not very revealing. Plays about three very different sisters go back to Shakespeare’s King Lear. In modern times, the topic immediately recalls Chekhov’s Three Sisters and more recently Wendy Wasserstein’s The Sisters Rosensweig and Beth Henley’s Pulitzer Prize-winning, Crimes of the Heart. Melissa Ross, whose excellent Nice Girl just completed its world premiere at the Labyrinth Theater Company, has entered the fray with Of Good Stock with a cast led by film star Alicia Silverstone returning to the New York stage. While the play is entertaining and believable under Lynne Meadow’s direction, it is also overly familiar without revealing any new depths. Each of the sisters is coping with a major event in her life. Jess has had breast cancer and is undergoing a harsh regimen of chemotherapy. She has not allowed her patient, understanding husband Fred (Kelly AuCoin), a food writer, to touch her in many months. Amy is in the throes of anxiety over planning her destination wedding in Tahiti to Josh (Greg Keller), who has doubts about his controlling and neurotic fiancé. Youngest sister Celia at 31 is bringing home a boyfriend for the very first time. She is high-strung about revealing that Hunter (Nate Miller) is an unemployed college dropout (though her own age) and that she is two months pregnant with his child. In the course of the weekend, the sisters argue, bring recriminations against each other for past slights, reminisce, tell jokes at each other’s expense, and make revelations. Which one did Dad love the most? Why hasn’t Jess sold the film rights for any of his novels? What is Hunter’s story? Is Jess dying as she hints? Will Josh go through with the wedding? When Josh has had enough of Amy’s demands, he goes off on his own precipitating a crisis in all their lives. While the dialogue is entertaining and believable, the play really isn’t about much except how families and spouses interact. 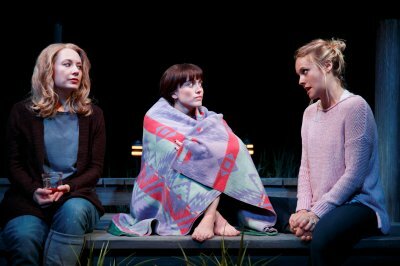 Not only does the play have no theme or message, the Stockton sisters may have typical problems but they are very self-absorbed so it is difficult to care what happens to them. Silverstone is asked by the author to burst into tears periodically, a habit that gets to be annoying. While Mudge’s Jess is the least neurotic of the three, her morbidness about the number of deaths in the family (mother died at 40, father was killed in a car accident at 55, etc.,) lays a pall on the proceedings. And Lind’s Celia seems to think the world revolves around her as she is about to become a mother. The men are potentially more interesting, although we don’t learn that much about them. At least they don’t appear to be neurotic or damaged by their upbringing. AuCoin is well-balanced as Jess’ husband trying to deal in a rational fashion with the emotional roller coaster her illness has set her on. Miller’s Hunter is a quirky package of liberated and unconventional values, but open to the idiosyncrasies of other people. Although we see him the least, Keller as Amy’s fiancé seems to be deeply in love with her but troubled by her demands and manipulations. Most successful is the production design: Santo Loquasto’s scenic design shows us the enviable Cape Cod summer home on a revolving turntable which allows us to see several rooms in the house as well as the patio, the dunes and the dock. This allows for a very varied mise en scène. Tom Broecker uses the costumes to define the very different personalities of the six characters. The realistic lighting by Peter Kaczorowski mimics the various times of day on the four sets as well as focusing attention where it needs to be. 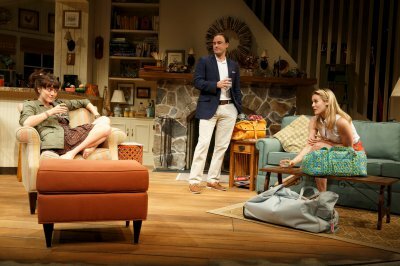 Melissa Ross’ Of Good Stock is a pleasant enough domestic play about a group of sisters in disarray. Unfortunately, the play ultimately has no message or theme to make it more meaningful. Lynne Meadow keeps things moving along and the actors are fine in their roles. However, they cannot make us care enough about these characters to make us understand what all the fuss is about. Kristin Chenoweth and Peter Gallagher set the stage ablaze in this delightful revival of the Cy Coleman/Comden & Green musical from the celebrated screwball comedy. Savion Glover’s propulsive direction and choreography makes for an exuberant, highly visual and sensationally performed revival of the 1972 Broadway revue.